Many years ago, my husband’s father was Potentate of the Almenah Shrine Temple in Nashville, Tennessee. At some point, over sixty years ago, he initiated bringing a Shrine Circus to Nashville. Little did he know that it was also bringing a future daughter-in-law. My husband’s oldest brother was just back from serving his country and getting ready to start college. He was hired on to help set up all the equipment. One look at this lovely young star, who had performed all over the world, including to full houses in Madison Square Garden, and he fell, hook, line, and sinker. They married, he got a law degree, Duina took time out to have three daughters, and then for years played the larger cities in Europe and America for just two months each year. 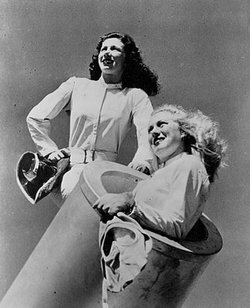 When I started dating my husband at college in Texas, he mentioned that he had a sister-in-law that was a human cannonball. I wasn’t sure I believed him, but after I mentioned it to my mom, she began to refer to him as ‘that nice cannonball boy.’ On my first trip to Nashville to meet his family, lo and behold, there in his brother’s back yard was a full size practice trapeze. Duina, was a sparkly, fun person. She was also very down to earth, at least when she wasn’t flying through the air. My brother-in-law took up sky diving. I guess, when your wife is a human cannonball, you might feel a need to do something out of the ordinary. When our children were growing up, we always tried to take them to the Shrine Circus when it came to town. One Sunday after the closing matinee, Duina asked us to lead the elephant owners and their trailer full of of elephants down to our family’s country place in the next county. It seems that though some motels take pets, they draw the line at Elephants. I had never thought about where you would park your elephants between show dates. This turned into more of an adventure than we had anticipated. There were two grown elephants and one small one, so the truck was quite large. We discovered belatedly, that one of the overpasses wasn’t quite high enough to get the truck through, and it took quite a bit of maneuvering to get it backed up and turned around with traffic and gawkers collecting rapidly. Then, they needed to stop for gas. Pulling into a gas station with a truck full of elephants was another challenge and I’m sure it was an experience the station attendants never forgot. We finally got the elephants happily staked out in a field near the creek and their owner’s RV hooked up to electricity and water at a near-by empty house on our family’s land. Mission ‘Where to Park Your Elephants,’ was safely completed.